We applied some angular-thinking for the artwork of the standard covers: Diagonals! The shortest distance between two points, cutely bevelled in at the corners. 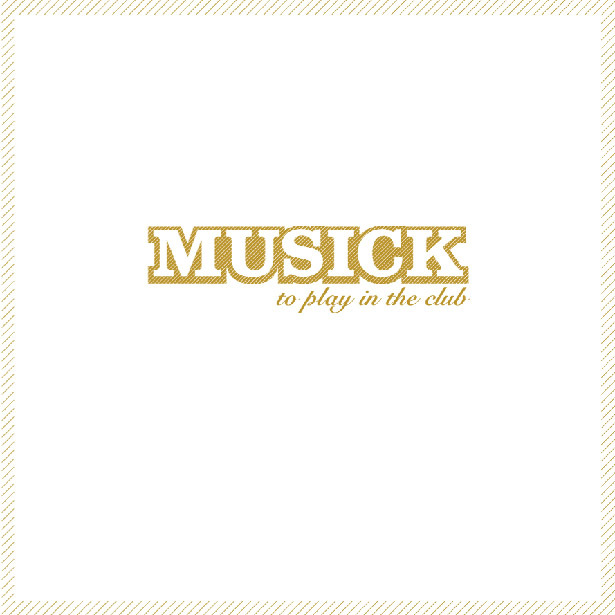 Musick to play in the club – a claim which concisely describes to anyone literate what it’s about. The marketing department actually does want DJs – in their Carhart clothes worn down by Mommy’s fabric softener so they’re not scratchy on those little legs – when they stand in the record store and represent, to think Madonna is behind all this, so they can rock the next lounge-chill-out. Only in this way can completely new target groups be shot in the back. Because after all, for those of us in the New Economy, it’s all about content – which means maximum satisfaction. And that old content-pig is running at full pig-gallop, blurting out a trendy wet bottom-burp at the consumers for the agency’s first release on “Musick” to play in the club. With “KICKING!” the Elastic Heads (Andreas Stobernack aka Kyborg, NBI and Trike, BPitchControl) make counting-rhyme techno, ideal for a fun game of musical chairs in the conference room during the lunch break. Jerry Abstract is a guy that T. met in Seattle, and right away one of his tracks was stapled onto Musick. The track sounds almost like it could be from the boss himself, just different, not to be understood as flattery, since “GRITTIN“ is way too coarse and XXL – just like Americans tend to be. And the boss himself is entangled in finely knit techno: With KøNIG SHUFFLE (PT. 2) he blows a dented fanfare from the pinnacles of the rusty knight’s castle down to the disco-barn where office buffalos like us live. And then there’s the unknown Peter Grummich, who sent a demo and a business plan, which, in terms of minimal techno, calls for more investment in marketing this brand, particularly “Dirty Disco Rock”, as he calls his campaign.